Krit Buranavitayawut received a Bachelor of Architecture degree from Silpakorn University in Bangkok, Thailand. He has been working in both music and architectural fields for many years with his strong belief that every kind of arts is united into one. He joined College of Music, Mahidol University as a full-time faculty member since 1999. His duties include teaching jazz saxophone, jazz theory, jazz pedagogy and coaching jazz combos. Krit ’s other duties include planning and equipping educational music facilities for College of Music, and Southeast Asia Music Museum Building. 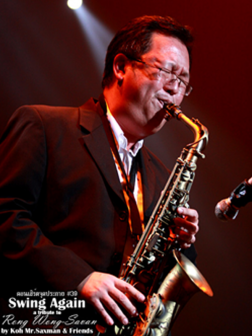 As the first-call bebop saxophonist, he has appeared in many jazz festivals and jazz concerts, leads William’s Jazz Band for more than ten years. A member of Mahidol University Jazz Faculty Ensemble, he has recorded the CDs: Music of His Majesty King Bhumibol Adulyadej, Celebrating Jazz concert. He has formed a jazz group named The Pomelo Town, with Darin Pantoomkomol, Noppadol Tirataradol, Kom Wongsawat, has performed at many jazz festivals and the group’s first record, Chasin’ Sangrawee, was released in 2006.